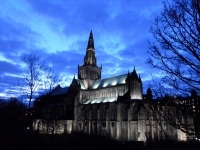 The history of the city of Glasgow is intimately linked to that of the Glasgow Cathedral, as it was the city's patron saint, St Mungo, who oversaw its original construction. The Saint's remains are buried in the cathedral's crypt, and the cathedral itself continues to form a vital part of the religious life of the city of Glasgow. The church has now been in constant use as a place of worship for a remarkable 800 years and its age is palpable. The cathedral's age is all the more remarkable considering how many of Scotland's churches were destroyed during the Reformation. The impressive medieval building, which dates back to the late 12th century, is one of the best examples of Scottish Gothic architecture you'll find anywhere in the country, featuring vaulted arches, stained glass, and spires that have been beautifully blackened with age. A highly recommended activity for tourists in Glasgow, take about an hour to explore the Cathedral's quiet, serene and splendid interior. Guide books in English, French, German, Italian and Spanish are available at the cathedral and simple leaflets are available in 12 different languages. Guided tours can be arranged, although this service is more limited in the winter months. Opening times: In summer (April to September): Open Monday to Saturday from 9.30am to 5.30pm, on Sundays from 1pm to 5pm. In winter (October to March): Open Monday to Saturday from 9.30am to 4.30pm, and on Sundays from 1pm to 4.30pm. Last admission to the Cathedral is always 30 minutes before the closing time.